The Schartz herbs and spices bottles are better than the Sainsbury’s ones. They’re taller and thinner, meaning that you can fit more of them within the same shelf space. The labels on the top are also clear. But the Sainsbury’s ones are cheaper. And, in any case, Sainsbury’s have refused to stock the Schwartz ones anymore because they want people to buy their own brand ones. So, I buy the Sainsbury’s ones and re-fill my Schwartz bottle. What is odd, though, is that Schwartz sell 20g bottles and Sainsbury’s sell 25g bottles. 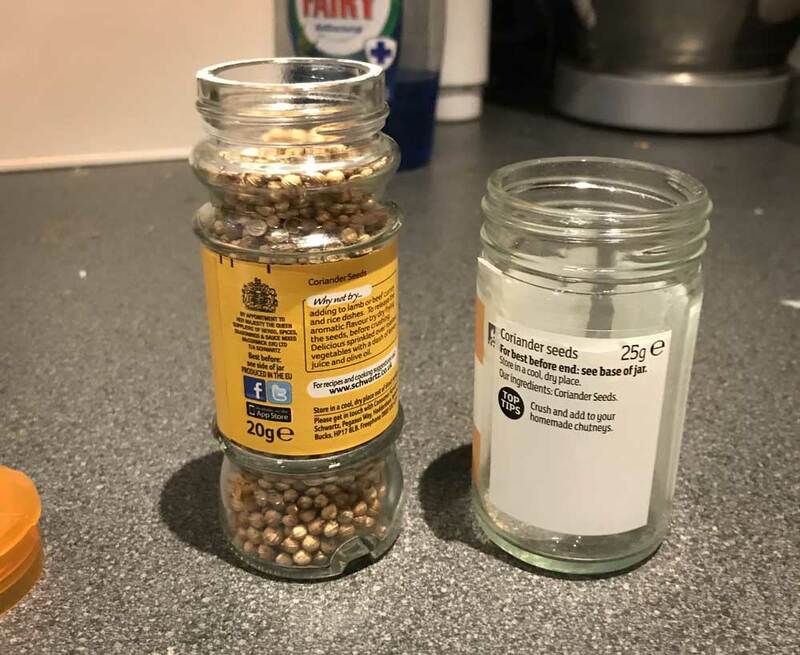 But, when you tip the 25g of Sainsbury’s coriander seeds into the 20g Schwartz bottle, they all fit in. This entry was posted on Tuesday, April 10th, 2018 at 11:00 am and is filed under Life. You can follow any responses to this entry through the RSS 2.0 feed. Both comments and pings are currently closed.